General and preventive health checks are a key feature of contemporary policies of anticipatory care. Ensuring high and equitable uptake of such general health checks is essential to ensuring health gain and preventing health inequalities. This literature review explores the socio-demographic, clinical and social cognitive characteristics of those who do and do not engage with general health checks or preventive health checks for cardiovascular disease. An exploratory scoping study approach was employed. Databases searched included the British Nursing Index and Archive, Cumulative Index to Nursing and Allied Health Literature (CINAHL), Cochrane Database of Systematic Reviews (CDSR) and Database of Abstracts of Reviews of Effects (DARE), EMBASE, MEDLINE, PsycINFO and the Social Sciences Citation Index (SSCI). Titles and abstracts of 17463 papers were screened; 1171 papers were then independently assessed by two researchers. A review of full text was carried out by two of the authors resulting in 39 being included in the final review. Those least likely to attend health checks were men on low incomes, low socio-economic status, unemployed or less well educated. In general, attenders were older than non-attenders. An individual’s marital status was found to affect attendance rates with non-attenders more likely to be single. In general, white individuals were more likely to engage with services than individuals from other ethnic backgrounds. Non-attenders had a greater proportion of cardiovascular risk factors than attenders, and smokers were less likely to attend than non-smokers. The relationship between health beliefs and health behaviours appeared complex. Non-attenders were shown to value health less strongly, have low self-efficacy, feel less in control of their health and be less likely to believe in the efficacy of health checks. Routine health check-ups appear to be taken up inequitably, with gender, age, socio-demographic status and ethnicity all associated with differential service use. Furthermore, non-attenders appeared to have greater clinical need or risk factors suggesting that differential uptake may lead to sub-optimal health gain and contribute to inequalities via the inverse care law. Appropriate service redesign and interventions to encourage increased uptake among these groups is required. Anticipatory care  has increasingly been seen as a means by which the increasing demands of an aging population , growing numbers of people living with long term conditions, and persisting inequalities in health  may be addressed [4, 5]. A key feature of such approaches are general and preventive health checks, defined as interventions which include a physical examination and/or an assessment of demographic and lifestyle risk factors which assess an individual’s current health or predict their chance of developing illness in the future . These may be carried out for primary and secondary preventive purposes, as part of annual routine health check-ups required among older age groups , or embedded opportunistically within routine clinical encounters . Regular community based general health check-ups are important for the early identification of risk factors for conditions such as heart disease, diabetes and stroke , as evidenced in the recent introduction of Health Check within the United Kingdom (UK) National Health Service (NHS). The evidence base to support such health checks rests predominantly on the known efficacy of the individual screening components subsumed within them. For example, recent National Institute for Health and Clinical Excellence (NICE) guidance on the prevention of cardiovascular disease points to the known effectiveness of interventions within health checks in relation to risk assessment, smoking, and physical activity . Such preventive health strategies may therefore also provide a cost effective way of dealing with the causes of ill health before they manifest into serious long-term conditions. Despite the potential importance and benefit of such health checks, their uptake is known to be largely sub-optimal . For example, data illustrating the implementation of the recent NHS Health Check in the UK has shown uptake rates of around 50% . Furthermore, there is good reason to think that the pattern of uptake is likely to be differentially spread across socio-economic groupings and thus follow the inverse care law [13, 14]: those who have greatest to benefit from the services are least likely to engage with them. Differential uptake therefore has the potential to exacerbate health inequalities . Consequently, knowledge of the socio-economic correlates of high and low uptake is important if current services are to be appropriately adapted in order to rectify such inequity. Community based health-checks which aim to effectively and efficiently screen maximum proportions of eligible populations, are likely to be complex interventions consisting of numerous potential parameters: method of invite, location, timing, and nature (duration and content) of the screening process. Consequently, the development of new forms of health check should consider the theoretical and empirical basis to support maximal uptake [15, 16]. What are the socio-demographic characteristics of those who do and do not engage with health checks? What are their stated reasons for not attending health checks? What are the clinical needs and risk factors of these non-attenders? To identify research gaps in the existing literature” p6 . This literature review followed an iterative scoping process which incorporated these objectives. The methodology was selected over the systematic review as its purpose was to explore the broad state of knowledge regarding attendance at general health checks rather than answer a clearly defined question. The breadth of potential studies and their heterogeneous nature meant that a scoping study with a narrative synthesis providing comprehensive representation of the evidence was more appropriate. A search of bibliographic databases did not identify any existing systematic review which focused specifically on this topic, and a decision was made to develop an alternative search strategy designed specifically for the project. This review considered both quantitative and qualitative studies including, but not limited to: project evaluations, randomised controlled trials, cohort studies, experimental or quasi-experimental trials, uncontrolled trials, systematic reviews, meta-analyses and studies using evaluation methodology such as the theory of change. Inclusion and exclusion criteria were developed using the ‘population, intervention, comparison and outcome’ (PICO) acronym as a framework , and are detailed in Table 1. Differences in the delivery of health care systems may mean that findings from studies in underdeveloped countries may not be relevant to the context of this project. This resulted in the decision to restrict studies to developed countries. Similarly, studies where health insurance was not controlled for were excluded from the review. Findings were restricted to papers on general or preventive health checks for the risk factors of cardiovascular disease, as other disease specific screening programmes (for example breast screening) have their own intricacies with barriers which are better understood and findings which are not always transferable. Papers on geriatric annual health checks were excluded as these were less likely to be of a preventive nature due to the age group and focused more on functionality and ability to live independently than clinical or lifestyle risk factors. Some papers which were retrieved considered general health checks and disease specific screening within the same study. Therefore, papers were included if they contained both disease specific AND general heart health checks, but excluded if disease specific (other than heart/cardiovascular disease) screening was the main focus of the paper. The databases used for the review were the British Nursing Index and Archive, Cumulative Index to Nursing and Allied Health Literature (CINAHL), Cochrane Database of Systematic Reviews (CDSR) and Database of Abstracts of Reviews of Effects (DARE), EMBASE, MEDLINE, PsycINFO and the Social Science Citation Index (SSCI). A wide variety of databases were chosen to allow the complex concept of ‘uptake of services’ to be explored from a number of different disciplines. Searches were performed on each database individually to improve functionality and allow search terms and limits to be amended from the original template (Table 2) to meet each database’s specifications. Specific database search strategies and terms are available from the authors. Given that predictors of uptake are likely to change over time as cultures, values and services change, a judgement was made to exclude older studies. A subjective judgment was made to include papers published from 1996 onwards. (MH exact subject heading, MJ word in major subject heading, MW word in subject heading, TI title). 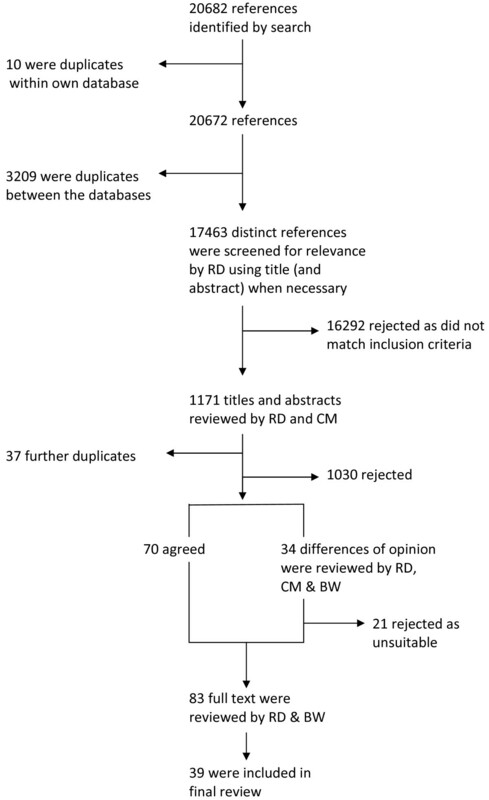 A total of 17,463 studies were returned after searching the databases and performing electronic de-duplication within and between each database; the breakdown of papers by database is shown in Table 3 and the identification and exclusion of papers throughout the process is shown in Figure 1. A total of 39 papers were included in the final review (See Table 4). The findings of the literature review are presented below using a narrative synthesis reflecting the Economic and Social Research Council guidance . Flow diagram of review process. Medical checkups: Who does not get them? Health checks in general practice: Another example of inverse care? · Overall uptake 62.4%; 59% at further education college, 28% at council cleansing department, 81% at greetings card factory. · The method of offering screening did not affect changes in behaviour but those who engaged opportunistically were more likely to intend to smoke less. Case against targeting long term non-attenders in general practice for a health check. Quasiexperimental Patient records were randomly sampled to assess attendance over a 3 year period. Do adults who believe in periodic health examinations receive more clinical preventive services? Random systematic sample of 1398 non-attenders identified 140 individuals who were repeatedly contacted and encouraged to attend a health check. Registration health checks: Inverse care in the inner city? · Non-attenders were significantly more likely to be unemployed, African, heavy smokers and of lower social class than attenders. · Those invited opportunistically were most likely to report that keeping their appointment time was easy, and were least likely to change it. · Those who intend to attend a health check placed a high value on their health; believe in their susceptibility to common illnesses and the severity of major illnesses. They believe in the efficacy of doctors and screening, have someone to talk to about problems and are more likely to be married or cohabiting. · Those presenting were in general healthy with low levels of smoking and alcohol consumption and mild hypertension only diagnosed in one patient. Are patients in favour of general health screening? Studies consistently indicate that males are less likely to engage with health checks or screening and to endorse periodic health examinations than females [20–28]. This difference in rates of non-attendance between males and females ranged from 8% to 19% in those invited for a health check at General Practice [21, 23, 24]. In community based drop-in sessions, women were more likely to self-present than males, with the proportion of attenders at least 60-65% female [20, 22]. Additionally, 11% of men compared to 6% of women did not endorse periodic health examinations . Two other studies found no difference in attendance rates by gender [29, 30]. In general, attenders at health checks are older than non-attenders [20–23, 25, 31–35], although some studies found no association between age and attendance [29, 30, 36–39]. In many cases the demographics of engagers were dependent on the targeting strategy of the intervention; for example where the service was only offered to a particular age group. Some of the included studies were targeted specifically at older adults while others were offered to an entire adult practice population. Although there was a tendency for attenders to be older than non-attenders, the heterogeneous nature of the study methodologies meant that it was difficult to define an optimum age for uptake. Indeed, the relationship between age and participation may not be linear. For example, participation in a health examination after completion of a health interview in the Netherlands followed a curve which rose with increasing age until 60 then declined significantly with any age above this . Individuals were found to be less likely to attend if they had low socio-economic status [23, 33, 34, 36, 38, 40, 41]. Defining which socio-economic/demographic characteristics differentiate between attenders and non-attenders was complicated by the numerous ways social status was reported in the literature. Some studies discussed social class, employment status, occupational training and level of education or years spent in education independently; whilst others used the terms interchangeably or as proxy measures for each other. In general lower uptake was associated with low incomes [21, 30–32, 42], being unemployed [38, 41, 42] and lower educational attainment [22, 25, 27, 31–34, 41]. Although these terms may be closely related, one study found that each had an independent effect on the attendance rate . An individual’s marital status was found to affect attendance rates with non-attenders more likely to be single [21, 23, 24, 35, 36, 42]. Studies suggested a possible interaction between marital status and gender in explaining uptake. For example, a number of studies reported that attendance at health checks was higher in males who were married or cohabiting, compared to single males [21, 24, 35, 42–44]. A possible explanation was proposed in a qualitative study using focus groups with participants and non-participants in community health screenings, which found that the decision to attend a screening is often made by the partner, with this initiation behaviour prevalent across a number of socio-demographic factors . The tendency of women to present more than men (as evidenced earlier) persists regardless of marital status. Higher rates of attendance in women who were single, divorced or widowed (79%) were found compared to men with equivalent marital status (65%). Furthermore, the rates of attendance were 88% in married women and 84% in married men, indicating that being married appears to have a stronger effect on uptake in men . Other studies have found no relationship between marital status and attendance rates [39, 41, 46]. In general, white individuals were more likely to engage with preventive health services than individuals from other ethnic backgrounds [22, 31, 38, 40, 46]. However, ethnicity was only reported in a small proportion of the studies (Seven of 39 papers). Only one of these reported no difference according to race . One paper reported a higher proportion of non-attenders at registration health checks were of African origin . On the other hand, a large American survey (n = 4879) found that 9.6% of white people did not believe in periodic health examinations compared to 3.4% of black people, and that black people were more likely to have been screened for cholesterol in the past 5 years than white people . What are patients' reasons for not attending preventative health checks? The relationship between social cognitive factors and attendance behaviour was not straightforward as although health beliefs were found to affect uptake , the factors influencing the decisions of attenders and non-attenders may not necessarily reflect “opposite motivations of beliefs” . To clarify, this meant that attenders may present for screening to reduce the fear or perceived danger of a condition, while non-attenders may have used the same rationale to not present, e.g. they did not feel at risk or were too frightened of the possible outcome if they did attend. Despite this caveat, non-attenders were shown to value health less strongly, have lower self-efficacy, feel less in control of their health and be less likely to believe in the efficacy of screening [39, 49]. Components of the health belief model were identified as significant predictors, with those who did not engage with services less likely to feel susceptible to ill health or perceive the conditions being screened for as serious as those who attended [25, 30, 48]. Individuals may present in response to symptoms, a family history of the condition , or to seek reassurance . Others are simply interested in their health, seek confirmation of a previous reading/monitor an existing condition or are worried well [20, 22, 45]. Those who do not present may have no perceived need for a health check: they may feel healthy or have an absence of symptoms [27, 33, 51, 52], are already in contact with the health service [27, 33, 41, 51, 53], or have recently had a health check [27, 51, 54]. Alternatively, they are aware they are unhealthy and do not want to be told off and have to make lifestyle changes, or have a fear of what it might find [26, 28, 31, 47, 51]. Fear acted as a barrier to uptake of screening in a number of ways, including: a fear of what the health check might find [33, 52, 55], the belief that “what I don’t know won’t hurt me”  and that knowing wouldn’t make them any happier , or the fear of the test results [25, 45] and their consequences . Concerns related to the procedure itself were also apparent in relation to a fear of needles or a general fear of doctors or medical settings, anxiety about what the tests might involve [45, 47] or the experience level of those carrying out the tests . What are the clinical needs and risk factors of those who present for health checks? Non-attenders had a greater proportion of cardiovascular risk factors than attenders. Smokers were less likely to attend than non-smokers [21, 23, 25, 27, 32, 33, 36, 38, 42, 46, 56]. Unhealthy lifestyle factors were important predictors of non-attendance, with odds ratios higher for smokers, heavy drinkers, and those with unhealthy diets and the obese . However, one paper showed occasional smokers and ex-smokers were more likely to receive a check-up than non-smokers  and smokers with the intention of giving up were more likely to attend than those who did not want to . A personal history but not family history of coronary heart disease (CHD) was significantly more common in non-attenders, as was a higher body mass index (BMI) , high cholesterol, systolic and diastolic blood pressure values . Follow up of non-participants in a prospective study of cardiovascular disease found that this group were more likely to have died than participants in the three years following the health checks. The difference in the mortality rates between participants and non-participants was biggest in the youngest age group (40–44 year olds), indicating premature death. However, the mortality rates were not significantly different between these groups for cardiovascular disease or cancer . The vast majority of studies supported the higher risk profile of non-attenders; however, non-attenders were found to have lower levels of cholesterol than those who did attend in a post-study follow up . In another study initial responders had higher total cholesterol but lower diastolic blood pressure than those who had to be re-contacted . In general, frequent or recent consulters at General Practice were found to be more likely to present for a health check [23, 32, 36, 40, 41, 44] but for some people this recent or on-going contact can be a reason not to attend [27, 42, 51, 57]. Consequently, this inconsistent relationship between frequency of attendance at GP practice and the likelihood of participation in preventive health screening has been described as ‘complex’ , and the two areas are inherently related. Some studies have shown that frequent or recent GP consulters are more likely to attend for a health check [23, 32, 36, 40, 41, 44]; for example, over 90% of patients who attended a health check at a shopping centre reported having a regular source of medical care . Conversely, other patients cited recent or ongoing contact with their GP as reasons for not attending a health check [27, 42, 51, 57]. A survey of attenders and non-attenders at General Practice in the past year showed that attenders were more likely to indicate that they would make an appointment for a health check compared to non-attenders (83% v 66%) . This review identified a substantial number of primary empirical studies contributing data to questions of uptake. Although the heterogeneous nature of interventions and populations precluded formal statistical meta-analysis, there appeared sufficient commonality across studies to inform a number of key conclusions. Routine health check-ups appear to be taken up inequitably with gender, age, socio-demographic status and ethnicity all associated with differential service use. Furthermore, non-attenders appeared to have greater clinical need or risk factors suggesting that differential uptake may lead to sub-optimal health gain and contribute to inequalities via the inverse care law. Our findings provide an initial contribution to the development of programme theories or conceptual frameworks to underpin future strategies, as suggested by NICE and others [59, 60]. Established and appropriate search strings were not available thus necessitating the development of new strategies. Like all reviews we cannot guarantee that studies have not been missed. However, our emphasis was on sensitivity over specificity resulting in almost 18,000 papers being examined by members of the team. We therefore believe that it is likely that few papers were missed. The purpose of the review was to identify sufficient studies across diverse contexts to inform the theoretical and practical development of future interventions to improve uptake of health checks. This necessary focus on diversity also meant that formal statistical meta-analysis or meta-regression of predictors of uptake would have been inappropriate. The majority of studies came from North America (n = 13) and Europe (n = 24), and the remaining two papers were from Israel and Taiwan. There may have been benefits from loosening inclusion criteria to include both geriatric health checks and non-developed countries. Such diversity could potentially lead to sufficient numbers of papers with common interventions or populations as to justify a number of meta-analyses of effectiveness or meta-regression of predictors of uptake. While the scoping nature of this study precluded such an approach for pragmatic reasons we have demonstrated that such a review may be feasible and desirable in the future. In his original description of the inverse care law Julian Tudor Hart’s argued that “the availability of good medical care tends to vary inversely with the need for the population served” . The validity of his law was demonstrated in a number of studies and in a number of ways in our review. Men from lower socio-economic backgrounds and on low incomes were consistently found to be less likely to engage with check-ups than women or people from a higher socio-economic status. Both of these variables are well established risk factors for a range of clinical conditions, perhaps most importantly in the context of this study, cardiovascular disease. This, again, was reinforced through this review since non-attenders were consistently found to have a range of poor lifestyle behaviours including smoking, alcohol consumption and diet. These findings suggest that without adaptation or increased efforts to increase uptake from these more “needy” populations there is the possibility that health checks, like other contemporary public health policies, risk exacerbating rather than narrowing health inequalities . Given the diversity of populations, clinical needs and motives not to attend health checks, a “one size fits all” solution consisting of promoting attendance at health checks and subsequent support for behaviour change is simplistic and flawed, particularly in the interaction with patients with complex needs . Indeed, the current focus on a limited number of delivery types, and a failure to tailor services may at least in part contribute to the problem. However, while it would appear sensible to assume that complex problems require complex solutions, there may be exceptions. The increasing role of both social marketing and financial incentives as drivers of behaviour change both focus on increasing perceived value while not essentially changing the service itself or addressing many of the pre-stated barriers. Incentive based schemes are gaining significant attention as a means of promoting behaviour change through extrinsic motivations [63–65]. However, such schemes have led to a number of questions with regard to political acceptability, ethical justification and effectiveness. In addition, questions over their ability to sustain behaviour modification, once an incentive is withdrawn, were raised . Given the preponderance of people on lower incomes among non-attenders, incentive schemes, whether based on finance or benefits in kind, may prove particularly effective and could be considered. If tailoring of health check-ups is to take place then consideration would need to be given to the varied demands that this would place on health professionals charged with delivering the service. Among the challenges surrounding service delivery are clinician’s frequently low adherence to protocols on prevention within consultations [66–68]. This may be related to a lack of awareness of, and agreement with, guidelines, or a belief that many practices and outcomes would be difficult to change due to time pressure and other issues [69, 70]. Moreover, clinicians in deprived communities are faced with higher rates of ill health and multi-morbidities, poor patient access, and high stress levels among clinicians, which in turn lead to higher demands on the service and service provider . Diversifying the provision of health checks to multiple tailored forms may well exacerbate these pressures and reduce service compliance to such new protocols unless tailoring is largely cost and time neutral. Certainly, increasing intervention complexity may be associated with reduced levels of implementation. An alternative approach may be to provide increased emphasis on opportunistic health checks at routine consultations; although even this has still been found to be time consuming . However, it has recently been suggested from a substantive evaluation of a complex outreach prevention service that the complexity of reasons for non-engagement among some people may not be predictable or “read in advance” ; this would suggest that whatever tailoring to services is made there will always be an imperative on the skill of the clinician to judge and respond to unique opportunities within the opportunistic consultation as well as wider systems approaches . “Focusing solely on the most disadvantaged will not reduce health inequalities sufficiently. To reduce the steepness of the social gradient in health, actions must be universal, but with a scale and intensity that is proportionate to the level of disadvantage. We call this proportionate universalism.” p15 . Such proportionate universalism would define “tailoring” as much in terms of the scale and intensity of action required for those most in need, as much as any changes in objective intervention form. Whatever approach is adopted, it is important that a clear theoretical underpinning that acknowledges both the complexity of the diverse population needs/attitudes and the challenges currently facing primary care and associated public health services is required. This synthesis of current findings has attempted to make a contribution to such a development. RD designed the study, conducted the review and contributed to the writing of the paper. BW was involved in the design of the study and wrote the paper. CMC contributed to the review and the paper. MTH contributed to the review and the paper. All authors read and approved the final manuscript.